Despite high-tech naval vessels and countermeasures, piracy is on the increase and spreading its area of influence. Berenice Baker talks to Glen Forbes, a former Royal Navy officer and co-founder of OCEANUSLive, a service that enables maritime vessels to share information about piracy threats in real time, about how the pirate menace is changing and what international navies are doing to combat it. The Indian Navy is one of several conducting counter-piracy patrols in the Gulf of Aden. Image courtesy of the Indian Navy. OCEANUSLive enables maritime vessels to share information about piracy threats in real time. Image courtesy of OCEANUSLive. Navies use unmanned aerial vehicles such as the Boeing ScanEagle to capture intelligence on pirate activities. Image courtesy of Boeing. The latest naval vessels including the Royal Navy's future Type 26 Global Combat Ship are designed to address piracy. Image courtesy of MoD. Berenice Baker: What does OCEANUSLive do? Glen Forbes: OCEANUSLive crosses the divide between maritime entities with concerns in the high risk areas (HRA) affected by piracy. By supplementing and increasing maritime situational awareness in HRA, the company seeks to improve security and safety of seafarers using a real-time information sharing platform. BB: Everyone is familiar with pirate activity in Somalia, but what are the other HRAs have you identified? "The International Maritime Organization (IMO) last year launched a campaign for orchestrating a response to piracy." GF: Somali piracy is very well documented, despite the continued inaccuracies of some information by various media. However, a growing maritime security threat is on the opposite coast of Africa. Gulf of Guinea pirate activity continues to increase and is often more violent in the first stages of an attack. The piracy seen in Asia, particularly the Malacca Strait, has been around for some time now. The combined regional efforts have seen greater cooperation between the navies, but the threat has remained prevalent. South America, particularly off Colombia, Venezuela, Guyana and Ecuador, has been at a lower level than the other HRA, but continues to appear on the plot. We have seen somewhere between 25 – 30 incidents, globally, each month throughout 2012. BB: Have you identified any trends in attacks? GF: Although we do not collate trends and analysis, it is clear that piracy has seen a reduction off the east coast of Africa through the increased use of armed guards and naval patrols operating closer to Somalia. "In the military there’s a view that in private military security there are a lot of cowboys." Pirates continue to move towards the Bab al Mandeb Strait when the monsoon kicks in and more dhow motherships are used in the Northern Arabian Sea and Gulf of Aden. Dhows have been targeted for use as motherships, but the larger commercial vessels (small tankers) have been attacked with fewer successes. West Africa attacks are based on bunkering of oil for the gangs operating in the region, additionally, the MEND in Nigeria support kidnapping of foreign workers. BB: Which navies are involved in intervention? GF: Between 25 – 30 or so different navies are involved at any one time. Under the umbrella of Nato, the EU and CMF, and the independent international navies, such as India, Russia, China, to name a few, they conduct patrols or escorts in the Gulf of Aden. To do so in the Indian Ocean is much too large a task for any organisation. Asia has combined efforts between Singapore, Malaysia, Indonesia, Philippines and so on. BB: How are navies responding in terms of patrols and using intelligence? GF: The recent extension of the EU mandate to permit disruption to pirate operations within two kilometres on Somali soil caused pirates to adapt their methods once more; however they have yet to show their hand while the onset of the south-west monsoon continues. Military authorities use as much open source information as possible, not always accrediting such sources, but OCEANUSLive has been a more trusted source of information not only by commercial maritime entities but also international government bodies. This is seen in the growing subscription to our newsletter by representatives from many of the naval forces at sea. BB: What new vessels and technologies are navies employing to counter piracy? GF: There are always calls for the use of new equipment and technology in the maritime environment. While the navies deploy varying degrees of sea power from corvettes, frigates, destroyers, landing platform ships and auxiliary ships, not forgetting the occasional use of aircraft carriers by the US Navy, there is more use made of unmanned aerial vehicles for reconnaissance and surveillance. Combined with the use of maritime patrol aircraft, the net spreads far and wide in comparison to recent years. BB: In your opinion are navies adequately prepared? "Gulf of Guinea pirate activity continues to increase and is often more violent in the first stages of an attack." 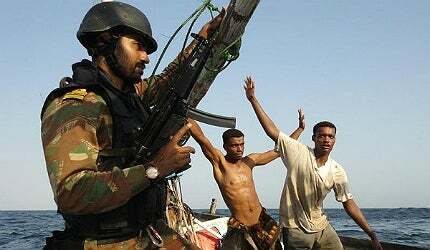 GF: Many EU members are ready to stop participation in the international anti-piracy patrol off Somalia. It’s expensive and there is a sense that the pirates are in permanent decline. As of this June only eight vessels and 215 crew members were being held for ransom compared to 23 vessels and 501 crew in June 2011. It’s been noted that no ship with armed guards has been attacked. The use of armed guards was long resisted, largely because of the fear that it would cause more violence. That has not happened, as the pirates do not press attacks on ships that fire back. How the navies prepare differs according to their mandate. Some will carry out rescue missions more readily than others. Some cite humanitarian reasons for not doing so in every case. The legal framework for addressing piracy as a whole causes problems for many and internationally agreed and accepted policies remain difficult to reach. Until then, the rules of engagement or rules of force remain at odds making preparations bespoke to each navy, even when under a single military organisation umbrella. BB: How should the responsibility for tackling piracy be split between the military and private security? GF: It’s a contentious issue because, and it’s often said, it shouldn’t be up to the shipping industry to protect itself. If there’s going to be a reduction in naval assets, then the shipping industry must take up much of the slack, whether it’s armed guards or improving their own security on board ships, which will cause more friction between the industries. In the military there’s a view that in private military security there are a lot of cowboys. The UK is one of the largest providers to the security sector and a lot of employees are ex-Marines that are doing the same job they were doing for the military only a few months ago. Yes there are cowboys around, but there are still a lot of professional companies doing a very good job. BB: What else needs to be addressed to combat piracy? GF: We concentrate on information sharing, which is a poorly-resourced area. There are a lot of individual risk management companies, maritime security and the military which all have their own information which needs to be shared. The International Maritime Organization (IMO) last year launched a campaign for orchestrating a response to piracy. They called for collaboration between the maritime industry and the security industry, but that has not quite come off yet. A recently released Maritime Bureau report reveals a startling trend: as attacks decrease, the hostage toll grows. Ship-technology reveals the true human cost of piracy off the coast of Somalia and across the Horn of Africa. USNS Rappahannock lets rip in the UAE killing one, Puntland forces capture five, Asian shipowners renew calls for a UN presence and South Africa shores up Mozambican channel. West African pirates conduct the first-ever hijack off Togo, Yemen gets green light to act decisively and US seeks death penalty. With MV Eglantine freed and UK hostage Judith Tebbutt released, debates over private security negotiating tactics have surfaced. A sharp increase in piracy has caused naval forces to find safer and more-efficient ways of inspecting suspect vessels.